When we first moved in our house, many years ago, there was an older neighbor across the street who knew we loved to go junking. When she cleaned out her garage or basement she would put things out at the street a day or two ahead of time facing our house, so we would be sure to see the object she thought we might be interested in having. 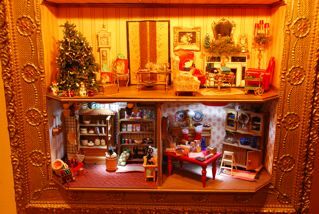 The Christmas house shelf was originally a knick- knack shelf that that someone had made from a frame. We cleaned it up and re-gilded it and it became our Christmas house. 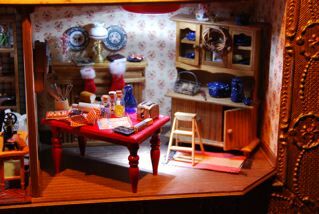 Both David and I love minatures and every now and then we redecorate the little house. 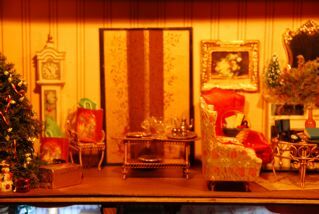 Some of the furniture is from a dollhouse I had as child. We have been going to electrify it for years. 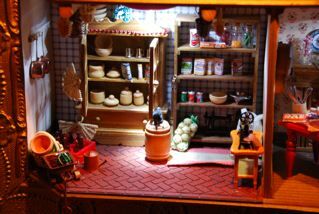 One of my favorite books is the "Borrowers" I love the idea that there are tiny people that live out of sight in the nooks and crannies around the house and borrow objects for their use. They made a movie from the book that I watch every now and again. If you haven't read the books, check them out and read them to the children in your life, they are magical. If you could see the books on the coffee table in the living room, you would see that they are tiny copies of several of my titles.